The Brexit campaign exposed divisions in and outside British society. What steps do we need to take to establish a geographic and political shift, towards a collaborative inventiveness? On the morning of June 24th 2016 London woke up to discover that the United Kingdom had voted to leave the European Union. The prime minister had resigned and Scotland was considering a referendum that could bring the very existence of the United Kingdom to an end. The narrow victory of 51% for Brexit and 49% against Brexit, shows a clear division within the UK society. What followed was a political meltdown and emotional debate based on complex and untrue information. Currently, Brexit is being categorised as a British problem, to be negotiated within a conservative economy survival mode. However, Brexit represents something bigger: it highlights the fact we seem embarrassingly unaware of how divided our societies are. (Social) media created a heavily contrasted image of Brexit. You are either “Remain” or “Leave”; there is nothing in between. On top of this, it seems easier than ever to surround yourself with likeminded people, creating your own truth and not being open to other perspectives. The support for the EU is higher among certain demographics – particularly young voters, university graduates and higher earners. Arguably, these people are more likely to value the freedom of movement conferred by their EU citizenship. But as the results of the referendum show, there is also a significant number of people in the UK that feel they have taken their economic and political rights as part of their British citizenship for granted, and as a result have been undermined by their status as citizen of the EU. Both Remainers as Leavers have one thing in common; they both have the feeling that their country is for ‘sale’, but with very different perspectives. The State of Unsettlement collective is a group of like-minded designers, makers and researchers who live, or have once lived in the UK. We consider ourselves pro-EU and affiliate with the “Remainers”, after discussions we even agreed to have prejudicial ideas about “Leavers”. Coming together and discussing the Brexit negotiations made us realize that we are looking at just one side of the spectrum, our side. Continuing this discussion and making work from a ‘Remain’/ pro-Europe perspective, we believe will become part of the problem rather than solving it. As designers and researchers we have been unable to stay neutral, and became part of a democracy where amateurs became experts of multiple truths. 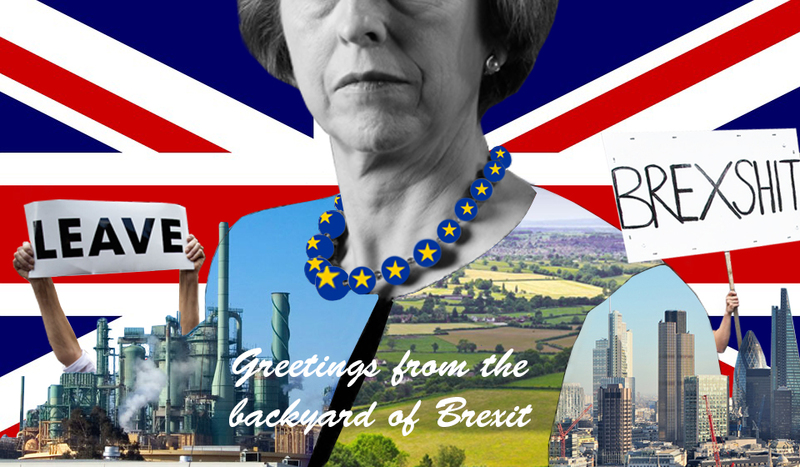 With this project, we aim to research the backyard of Brexit, and the role of the designer within a divided society. We need to step out of our comfort zone, our prejudicial bubble, to break free from our stereotypical view on Brexit, and discover new perspectives. How can a designer as maker/craftsman, mediator, storyteller, agent or catalyst start and develop a balanced dialogue between opposites? We start with eliminating the word ‘Brexit’ and push the meaning towards new forms of being together and society. Through our personal practice (craft making, writing, film, performance, etc.) we will explore new ways of communicating and transforming delicate topics that impact everyone within society. The members of the group will each travel to different locations in the UK or Europe that are related to the deeper tissue that created Brexit. These locations are chosen by research – for example visit a region with a high amount of Leave voters, an industry that disappears because of Brexit, or exploring relational rifts. At these locations participants form their project research and investigate the role of heritage, identity, industry and myths to recover insights on the making of society. From this point of view the participants can voice and develop a new position/vision on the State of Unsettlement. The new insights of each participant will be converted into new design work. All the different and new design (conversation) pieces will be brought together in an exhibition. The exhibition is an overview of a variety of stories from different places that have one thing in common; they all show their own view on how a society deals with division.